See that nice man in the cherry picker? He was here Friday morning to cut power to the cabin. Yes, we asked for a weekend in the dark. 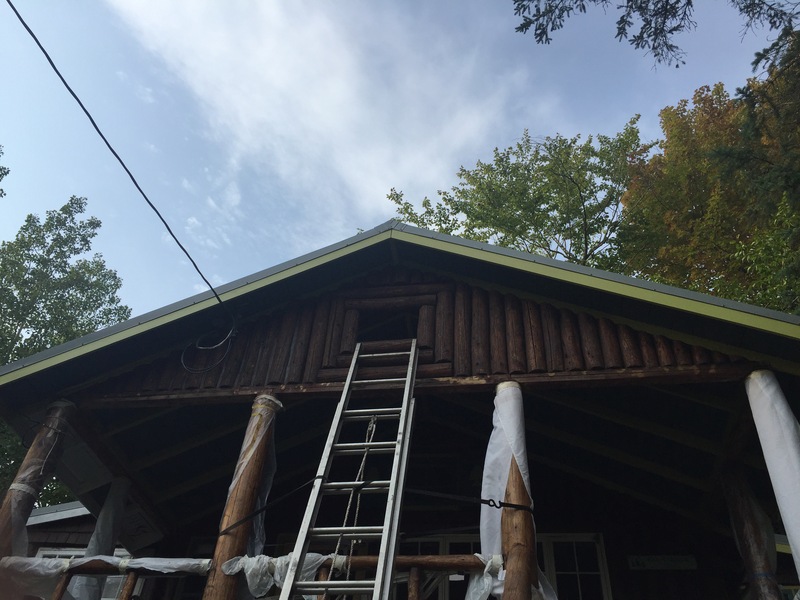 One of the last summer jobs is to finish staining, painting, and caulking the porch, and we needed to do the section where the service line attaches to the house. Because we’re 15 feet in the air on ladders doing this, and it involves at least one power tool as well as having to move the loop of wire to get to some logs, we opted to avoid getting shocked and just turn off the juice. Luckily, the garage is on a completely separate meter, so it could stay on! Totally unforeseen benefit. We had a schedule and a deadline, given many drying time cycles, and the weather just barely cooperated–we made it! Now to have them out to hook us back up tomorrow (fingers crossed), because we really need a shower! 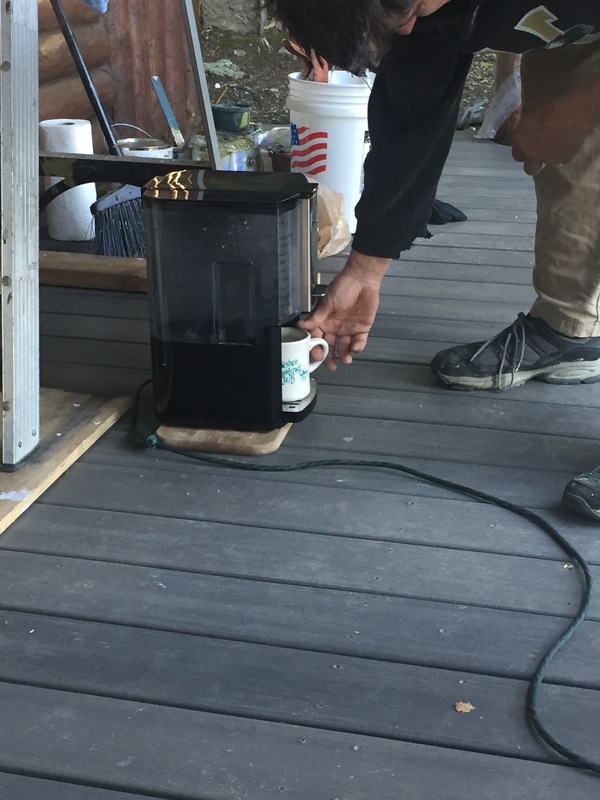 Porch coffee, thanks to garage extension cord. 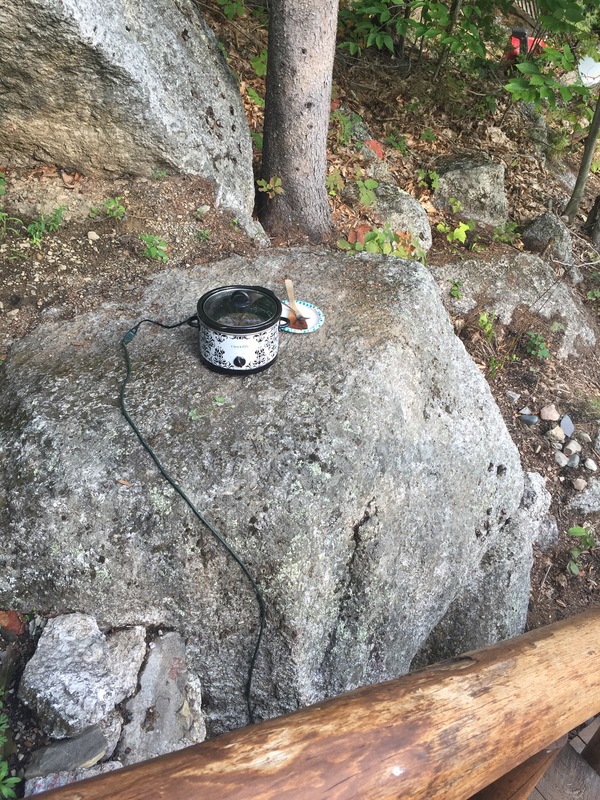 And crock pot on a rock (tonight is stroganoff with some garden green beans tossed in). Maybe later we’ll haul the microwave out on the porch for popcorn and movie night, running old DVDs on a laptop. Not so much roughing it…but that SHOWER would be just so great. Last week I was in the Czech Republic, hence no blogging. It was awesome! It was a work trip with some sightseeing as well. Prague is as amazing as everyone says. 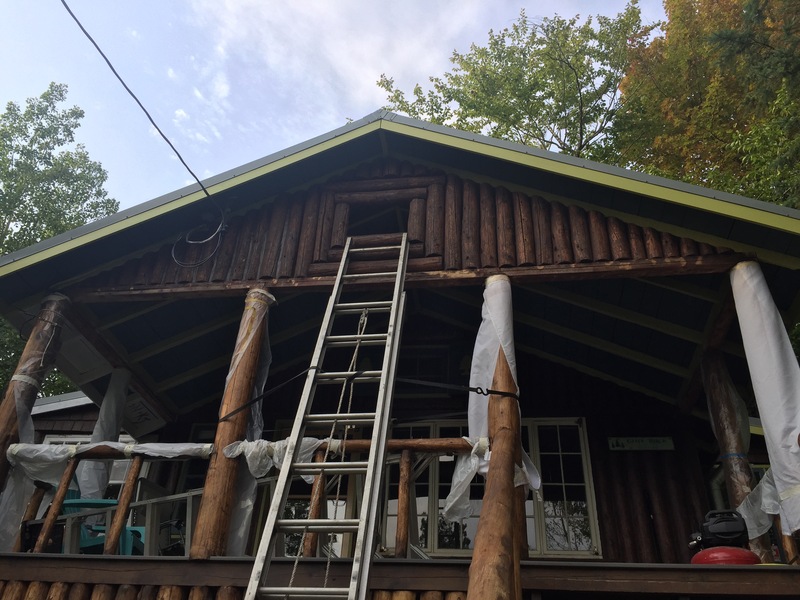 There’s an eye-candy slideshow at the bottom of this post, but since this is a cabin blog, here’s what happened while I was away and since I got back. K worked on making screens for all the windows! Having no screens on most of the good cross-breeze windows has meant either having lots of mosquitoes (no thanks) or being pretty hot in here (also no thanks). Next summer we’ll be set! He used a pile of never-used screens we picked up at the ReStore several years ago for about $10, and cut down/rebuilt to fit the openings. He used up all my vintage galvanized hinges, and knobs/hooks are on the way. Now you just swing open the screen, open the window, and close the screen again – we saw this style on some new Marvin windows a while ago, and it’s perfect for our windows. Pair of screens in the study – prime breezy spot. And in the bathroom – a wonderful improvement. Approved by Bisbee, who can now stare at the big rock all she wants. Then, we got back to porch painting this weekend. It was ladder weekend, since the front section (the only one remaining!) is at a bit of a height. 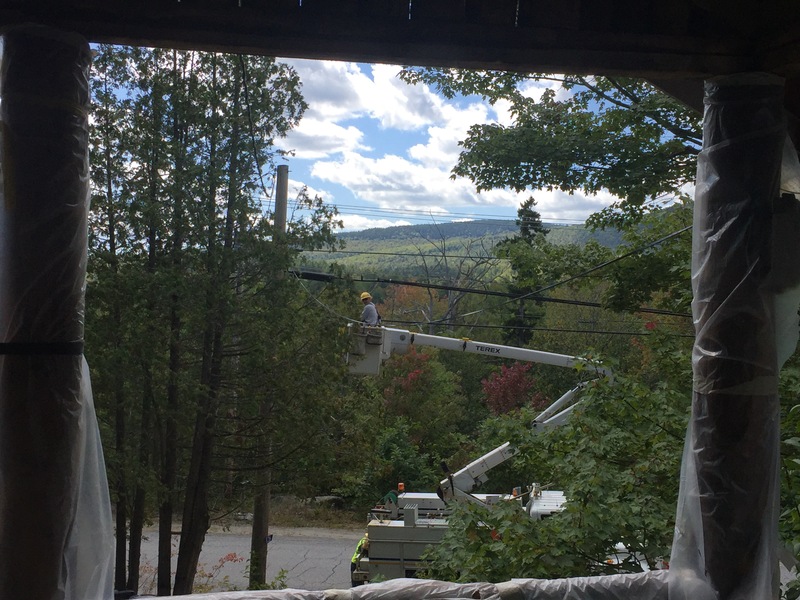 We did all we could this weekend, and need to get the power shut off to finish up next weekend. So we’ll be boondocking it. But, such an improvement – this is the last of the old, cruddy red paint! Some grinding done – great weather for it! About 2/3 of the front is done! Only a small bit of red left.